Poetry and the Self are common themes in the work of both Emerson and Dickinson. Shira Wolosky writes, "Dickinson's work, in its recalcitrant selfhood, specifically recalls Emerson's writings, and it also more broadly refers to the general and looming concern with autonomy and individualism so central to American culture." John S. Mann also cites the influence of Emerson's concept of "poet as namer" on Dickinson: "And, in using names to create vivid metaphors, in encountering the world and defining it in the luminous transformations of her poems, she uncovered tensions-within herself and in the world-which finally brought her far from the experience and artistry of Emerson. She found she could neither rest in Emerson's assumptions nor wholly follow his practice." Read more about Emily Dickinson here. Mann, John S. Emily Dickinson, Emerson, and the Poet as Namer." The New England Quarterly 51.4 (Dec. 1978): 467-488. Wolosky, Shira. "Dickinson's Emerson: A Critique of American Identity." 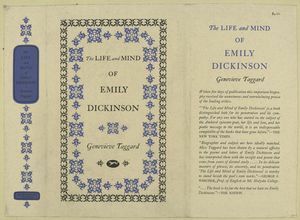 The Emily Dickinson Journal 9.2 (Fall 2000): 34-141.